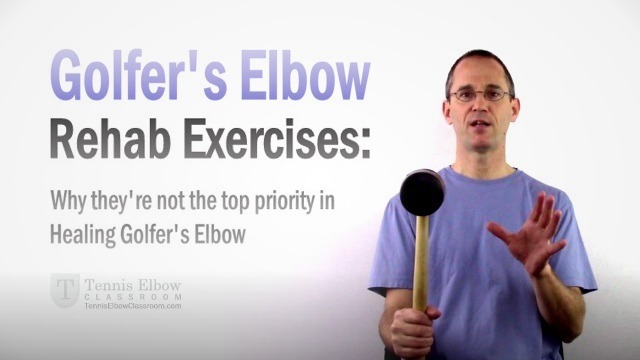 Golfer's Elbow Exercises - Not A Top Priority For Healing? Many authorities claim they’re critical to recovery, but I’m going to go against the grain (as usual!) and suggest some reasons why rehab exercises may initially be a lower priority. Not that I’m completely rejecting their value! I’m just disputing their place in the order of things. I simply believe they belong in “Third Place” – Never First. Tendon Remodeling – Exercise (especially Eccentric Exercise) has been shown to help the remodeling stage of tendon healing, but that’s the third and final stage of healing – Not the first. The muscles involved in Golfer’s Elbow, the Wrist and Finger Flexor Muscles are some of the most adaptable in the human body. And although some of these muscles may be weak in some Golfer’s Elbow sufferers, what I find time and time again, treating people with this vexing condition, is a great deal of “tightness” and restrictions in this muscle group. And ‘Adhesions,’ which are when layers of tissue literally stick together. ‘Adhesions’ happen gradually over time (in everyone as we age) and more rapidly and severely in areas that are under higher-than-normal or constant stress. Adhesions also happen more rapidly when there’s a sudden, Acute injury (like a significant tear) in which case we get Scar Tissue, and with it, a lot of Adhesions. The result is the same either way: An often dramatic restriction in mobility and flexibility. And I’m convinced that “releasing” all this tension and adhesion restriction is the number ONE priority for most Golfer’s Elbow sufferers. Will Stretching And Exercise Help Release It? No. You can’t simply “stretch it out” (Not past the very earliest stages, anyway.) Stretching may reduce some of the muscle tension, but it’s just not going to release those sticky Ahesions. And, unfortunately, you can’t “exercise them away” either – Exercising too much or in the wrong way can actually compound the problem! Advanced Massage Therapy Techniques can release these Adhesions, though! The right kind of very specific Massage Therapy (or ‘Manual Therapy’ to get technical) can release those adhesions. Even deep, dense Scar Tissue that’s been there for years, which nothing else will touch. It’s a very “mechanical” thing, in a way, involving the right combination of pressure and tension. Now, any kind of massage – even the most basic – is a start, naturally! However, some methods are vastly more efficient at releasing these stubborn Adhesions than others. If you’d like to learn more about the Golfer’s Elbow Self-Help Program where I teach people like you how to release your muscle and tendon adhesions and recover naturally, please click here for the program overview. This might come down to common sense. Most of us are familiar with the idea that after we have a typical Acute Injury, (as in one that involves obvious, sudden trauma) like an ankle sprain, there’s a certain, expected time frame for healing. Sure, it depends on how severe our injury is (and our age and general health, and such factors) but we can count on a certain semi-predictable progression of healing. And we know that the first priority after an injury like that is to take a certain amount of time to “rest” it. Rest, of course, means different things in different circumstances; rest after a sprained ankle may mean “Staying off it for a day or two, then walking short distances with it wrapped up” and so on – Whereas resting after a fracture means NO use of that area at all for some weeks. But the rest will be consistent with the nature and degree of the injury. And this is where things get really confusing and people are often led astray and get into trouble (often with the “help” of bad advice) with Golfer’s Elbow and other tendon conditions. And, if there’s one idea about Golfer’s and Tennis Elbow that you can just toss out the window and safely forget – Is the myth that there’s some kind of “typical healing time” or “rate of recovery” for it. Which doesn’t mean there’s nothing you can do to encourage and speed up your recovery! Tendons have this notorious tendency to NOT heal – And no amount of time (by itself) necessarily helps. So, the point here, (sorry it took so long to get to) is the uncertainty of knowing just where you are in your tendon healing recovery process. And that it’s a good idea / perfectly safe to begin rehab exercises for it after “X” number of weeks or some other arbitrary time period, doesn’t mean jack! After all, isn’t it simply common sense that exercises can very easily aggravate an injury if started too soon? That’s one of the top complaints I hear from the people I treat directly in my office and the people I talk to by email, in the member’s forum and in Skype consults. Okay, you’ve stuck with this post this long, so now I’m going to hit you with the third point, which is a lot more technical than the first two.. There has been a fair amount of medical research on the effects of rehab exercise on tendon healing over the past 20 years or so. And it has been shown to help what’s known as the ‘Remodeling’ Stage of healing. The thing is that the Remodeling Stage is the third and final stage of healing – Not the first. Now, common sense suggests that RE-modeling presupposes that something was built there in the first place. And just like you first need to HAVE a house before you can remodel it, my understanding is that there needs to BE an ongoing process of Collagen building (generation / regeneration) in the tendon before that Collagen can be remodeled. They overlap quite a bit, like this: First 1 – then 1 and 2 – then 1,2, and 3 – then 2 and 3 – and finally just 3. My point is that it (and the exercise to encourage it) is not the priority, and that I believe you’ll make better progress if you focus on prioritizing and making sure the first two stages, (inflammation and repair) don’t stall and fail and leave your tendon sliding deeper into the sludge of stagnation. And to stimulate the tendons with a lot of direct pressure and friction to keep the circulation and healing process going there. And then, finally, to gradually add exercise – which eventually does become the top priority as you progress and your recovery moves into the final stage. New Golfer’s Elbow Self-Help Program – Break your vicious cycle of elbow pain at home with the help of this self-help treatment, stretching and exercise program: What’s in the Golfer’s Elbow Program? New Program For Golfer’s Elbow! Sick And Tired Of Golfer's Elbow? If you're fed up with all the resting, hoping and waiting, and want to learn how to break your vicious Golfer's Elbow cycle naturally, click HERE or picture above to learn more.